1. OUR PULL UP BANNER BASE IS MADE OF BRAND NEW ,SOLID & THICK ALUMINIUM MATERIAL,TO MAKE SURE YOUR BANNER IS DESIGNED FOR LONG TERM USE. NO CHEAP PLASTIC PART IS USED. 2. OUR PRINTING REOSLUTION IS PHOTO QUALITY, WITH OUTDOOR WATER PROOF & UV PROOF. NO COLOR FADING ISSUES FOREVER. 3. WE PRINT YOUR GRAPHIC ON YOUR CHOICE OF MATERIAL (SEE BELOW), NOT THIN / CHEAP / EASY BROKEN/ CURLING MATERIAL. - It's ANTI-TEAR polyproline poster material, Ideal for general indoor use only with high resolution printing. It's low cost material and it has short term non-culring feature. - It's premium NEVER-TEAR photography film, Ideal for super high quality photo graphic printing. It has life-time anti-curling feature, for long term high frequency use. It's suitable for both indoor and outdoor use. It has grey block out coating on back side to block out the backing lights , this will ensure your graphic display color is aways solid and vidid. - It's extreme heavy duty never-tear material, Ideal for super high quality photo graphic and everyday outdoor use. 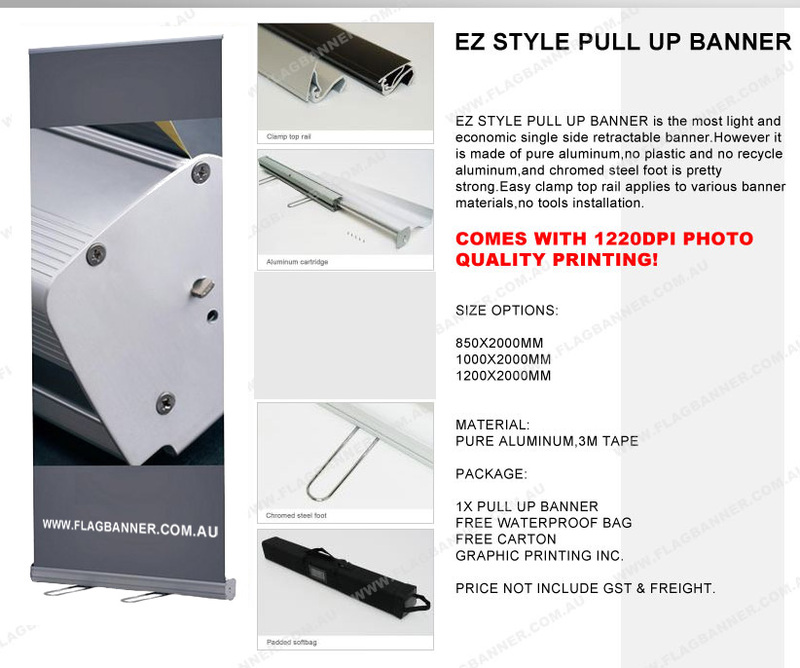 PLEASE MAKE SURE YOU BUY GOOD QUALITY PULL UP BANNER TO PRESENT YOUR BUSINESS. 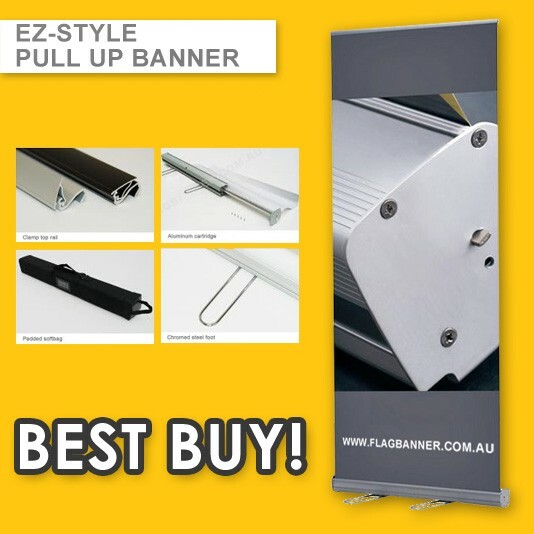 Pull up banner display system is perfect for on the go advertising. Like other retractable banners, this banner stand automatically rolls trade show graphics into the base. This pull up banner is ready to go almost immediately - just raise the pole and pull out the banner. The rollup action also protects the trade show graphics during transportation and storage. 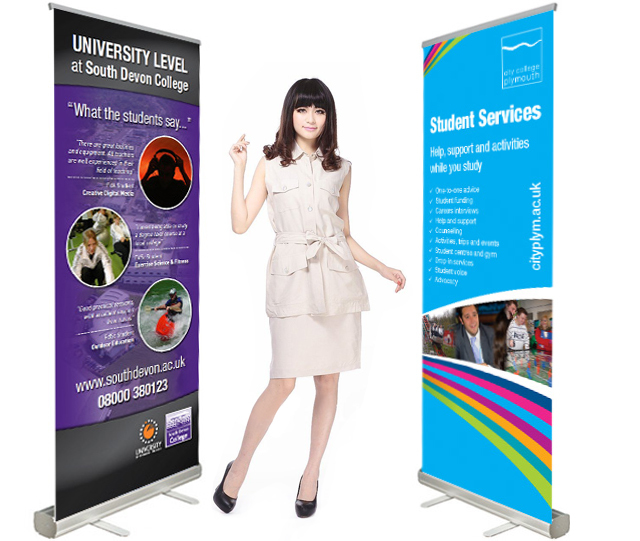 As a self-contained display, this pull up banner keeps everything you need right in the base. The body of this pull up display system is constructed from anodized aluminum and has two flip out feet for stability. Included with this pull up banner is a custom printed banner. Printed from the artwork customers supply.This pull up banner is contained in the cassette by friction snap rails and can be changed out with a little effort. This portable graphics stand is easy to set up and can be completed by one person in a matter of a few minutes. Use this pull up banner at a trade show event to further increase your company's exposure. There are other sizes offered within this line of retractable banners for customers looking to make an even larger visual impact at a show. FREE UPGRADE TO ULTRA SMOOTH GRAPHIC MATERIAL THIS MONTH! C. WATER PROOF & UV INK! NO COLOUR FADING FOREVER!